Choose something and do something. I see what you feel. Being lifts the weight of waiting. The whole story needs your story. A good heart keeps on ticking. Can't read my writing? What's the matter with you? No, my story sentence is not compelling in any traditional way, but I found it memorable enough to stick in my mind over 7 miles of local running trails. With it, I was able to capture and carry 10 ideas generated on the go. Can you guess which of the words in the example story sentence are key words? Dazzling: This key word I chose to help me remember a "Daily Thought" I conceived of: "Dazzle them with similar wrapped in different." Pillow: To remind me of a plot point to include in my novel-in-progress. Turtle: For a Facebook post idea, about a turtle I almost stepped on along a running trail. Apple and Broccoli: For a new habit idea, to allow myself no calories each day until I have eaten an apple and some broccoli. Clock Tower: Another novel plot point. Stentigram: A coined word combining the words "stentorian" (denoting another plot point idea) and "Instagram" (to remind me to post a request for beta readers for my new novel). AGA: An acronym for that blog post's concept: "Anchor chart Google Approach." Smile: Another Daily Thought: "My smile needs nothing from you." I hope you will give this a try anytime you have multiple ideas and no place to put them. It takes practice to piece together an increasingly lengthy and absurd story mnemonic, but it gets easier -- and I trust you will find it well worth the productivity dividends you soon accrue. BONUS: Photos of another example, including five pages of decoded notes after the story sentence, transcribed in the car immediately after a run. With all due trepidation, I admit that until a few days ago I was not a Harry Potter fan. What can I say? When, years earlier, I read Harry Potter and the Philosopher's Stone, I was not feeling the magic. In my defense, this was in the midst of a dark, mugglish phase of my life. I know, I know. Why should you keep reading such a scandalous affront to good taste? Who is this guy? Can a person trust such a person? Wait. Shouldn't you be happy for me? Like – OMG, the grand story awaits you like a glorious banquet! That is the sort of thought resonating through my mind when I recommend X book or Y movie or Z tv series to a friend who somehow missed out when most of the rest of us were all-in. The Fault in Our Stars. Baby Driver. Breaking Bad. I hope you're feeling this feeling for me now. I imagine that you are. And this imagined feeling I ride like a wave. No doubt you saw at least one of those "Which Hogwarts House Do You Belong In" personality tests that made the rounds to commemorate Harry's 20th anniversary on 6/26/2017 – that being my birthday, by the way – coincidence? – perhaps not. ​I'm a sucker for personality tests. When I came across a Hogwarts iteration, it reminded me that my Myers-Briggs results (INFP) purportedly correlate with the personality of none other than Harry himself. I couldn't resist taking the Hogwarts test to see whether I would be sorted as Gryffindor. So: Huffleclaw: predominately Hufflepuff yet also significantly Ravenclaw in nature. ​Since so many folks these days share their Hogwarts affiliation on social media, identifying as such in their bios, I wanted in on that action. Once you post a Hogwarts affiliation, you're duty-bound to read the whole Potter series if you have not already done so. Anything less would amount to sheer hypocrisy. Yes, I am all-in. Committed. Happy. This stuff is better than good, it's otherworldly. I am feeling it. Which brings me back to page 36 of Harry Potter and the Chamber of Secrets. Thus far, my biggest takeaway is: J.K. Rowling is a genius (duh) in ways myriad but particularly in juxtaposition – contrast – commingling opposites. Is it any wonder the Harry Potter books constitute the best-selling series of all time? Such unforgettable juxtapositioning essentially weighs reality against fantasy, disappointment against ideal, hell against heaven. Don't we all want a secret identity, secret powers, a destiny with a higher purpose, adoration, respect and Quidditch? ​Don't we all feel trapped by circumstance, holed up in a metaphorical room under the stairs or a chamber offering only a catflap of a connection to the outer world? Rowling paints our anguish and desire on the page with colors magical, breathtaking, and bold. We appreciate the art. But enough with the analysis. I have 998,712 more words to read. I used to marvel at writers who write a lot. Now, I'm glad to say, I am one of those writers. My secret is not innate awesomeness. It's routine. Make an outline document for your novel. I like using Google Documents for this as well as for each of my chapters. Include a section for: title, genre, logline, principal characters and their primary strengths, flaws and desires, and an initial sketch of the plot. I recommend studying the hero's journey. Don't start writing until you have strong ideas for all key plot points. Particularly important, I think are a beginning with a hook, a reversal midpoint that represents some kind of severe setback or near-death experience, and a killer ending you will look to writing. Choose at least one chunk of time per week to get at least the first 2-3 hours of writing done. I love going to Starbucks on a Saturday or Sunday morning, setting up my iPad with keyboard, and savoring a Venti Peppermint Mocha while listening to the Moana soundtrack or The War on Drugs album Lost in the Dream on my wireless headphones. This first session should give you momentum. Choose a day of the week to be an "accountability day" upon which you will share with someone what you have produced. Mine is usually Friday, though sometimes I finish early. Create a weekly writing goal. Mine is one chapter. Typically, this turns out to be 10-20 pages. Use the magnetism of accountability to attract you to your goal. Sprinkle in writing time as needed throughout the week in order to meet your goal. Share your work with your accountability partner or group. For me, this is my wife and my 8th-grade students. To the latter, I read aloud one chapter per week. This I have found to be a powerful force of motivation. I know at least some students are waiting to hear what happens next, so I am inspired to write something good for them. You might choose to share with a writer friend or with a writing group. Solicit feedback. I pose a Google question to my students via Google Classroom. You might ask for email responses, verbal responses, or comments on a shared document. Once you have feedback, copy and paste it as a group of comments in the chapter document. If any errors are easy to fix, do so right away. Leave all other errors to fix after you've completed the novel's first draft. Otherwise, you will be liable to get sidetracked, stuck in the mud where your wheels are destined to spin. Of course, when reviewing feedback, you need not make all suggested changes. Let the comments simmer. Decide later what the best course of revision will be. Once you've finished your novel's rough draft and revised and edited according to your feedback, print out one chapter at a time and revise and edit by hand. This often leads to better revisions. Print the chapter again and record yourself reading it aloud, pausing to make corrections whenever you find new errors, unnecessary repetition, or awkward passages. For this, I use the Voice Memos app on my iPhone. Then I send myself the completed audio file and upload it to Google Classroom for students to review if they wish. I don't know how many listen to these, but I know that at least some of them do, and this gives me an extra boost of warm-fuzzy to stoke the fires of my commitment. Make changes based on the notes you made while recording. Repeat until your routine becomes second nature. Of course, my routine might not work for you. Then again, it might. Try some or all of it. Tweak some or all of it. Or not, and not. But do something. Good routines do not just happen – they are cultivated. So get cultivating. Drop everything and ROUTINE! Most writing experts agree that it's best for fiction to "show, don't tell." Simply put, that means that a story should come to life like a movie or a virtual reality scene unfolding in brilliant detail in the reader's imagination. If you find yourself thrilled by a particular piece of fiction, chances are you are under the spell of a word-wielding wizard who knows how to put on a show. Today, I experienced a "show, don't tell" epiphany. It came to me through my Bluetooth headphones, and it was music to my ears. 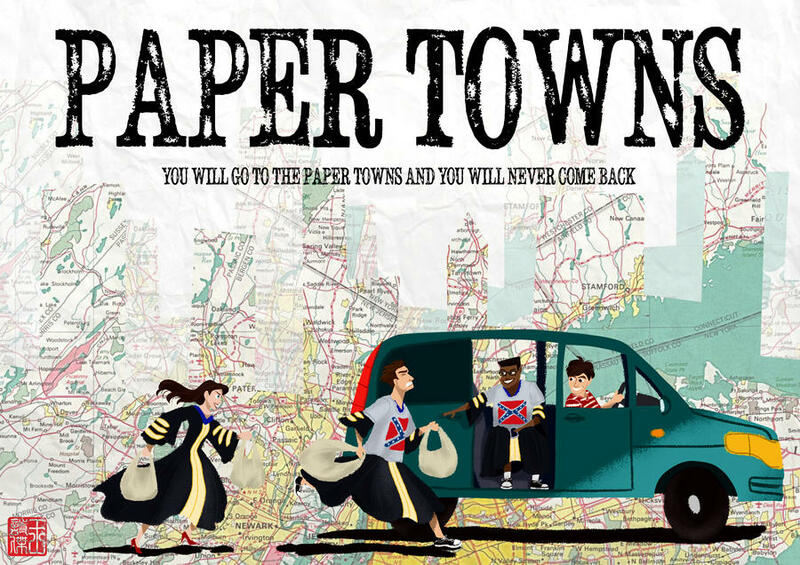 John Green's Paper Towns works brilliantly as a mystery, a comedy and a YA coming-of-age story in no small measure due to its strange, ingenious plot structure. When writing YA, don't forget the young or the adult. For decades, I hated running. Now I love it. IMHO, writing and running are sole mates.